Good mornin' America/How are ya? 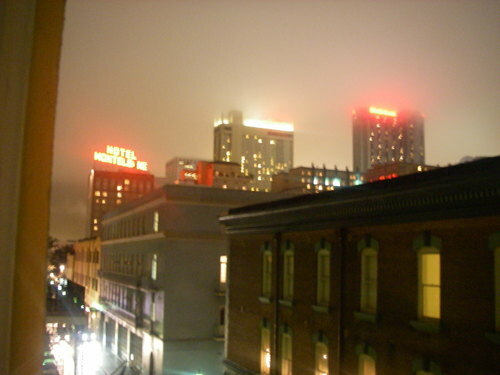 NK and I got back from New Orleans last night. See, this should have been 2002. We all know goddamned good and well that these things get started in moments of anonymous narccicism, before they are catapulted into the femtosecond celebrity aspirations that we've all come to know and sheepishly cop to. I'm not worried about that part. Anybody whose opinion I give half a damn about already knows that I'm a pedantic blowhard, so this isn't really going to modify their impressions one way or the other. The part I'm concerned about is that I may have already missed my best material. I'm not sure - I haven't researched it properly - but I think there may be some kind of rule, be it unwritten, whispered, memed, wikied or branded backwards on the forehead of procrastinators, that says you don't get to retroactively blog. At least not in the sense that one normally would see it appear in real time. So when I got back from The Expedition in 2003, and some of my hipper coworkers chastised me for sending them 320KB email messages detailing near-death experiences in Thisorthatistan, I should have known then and there that I had fucked up big time. I'm not going to go into this in depth here. I knew when I registered wemakeholesinteeth that the function of this site wasn't going to be to show all my overeducated pals what a great expatriate I'd be. I have other hopes. And they mainly have very little to do with me and my late-blooming geographical digressions.